Why do you like volunteering for the Campaign? It has always been so fun and easy to talk about the Boundary Waters! Like so many others I shape my summers around this place, so it only feels right to share the awesomeness of the BWCA with others, and how we can protect it! I first presented to my high school, Benilde St. Margaret's in 2014 after signing Dave and Amy's signature Canoe in Duluth, at the first days of their Paddle to D.C. trek. Since then the campaign has grown so much, and I feel lucky to have been apart of it all. What is your favorite event you’ve ever volunteered at? The MN state fair 2018 was a blast! Getting to talk to the sheer numbers of Boundary Waters supporters that came through our booth was an absolute joy. What is your favorite lake? Clearwater lake! Hiking up the Palisades is the best! Favorite memory in the Boundary Waters? My boyfriend and I camped on Caribou Lake a few years ago and took a trip to Johnson Falls. We had the most spectacular picnic under the waterfall, a moment I truly will never forget. What would you never go to the Boundary Waters without? My coffee press - can't go without my coffee! Why do you want to protect the Boundary Waters? The Boundary Waters has been exhaustively protected to maintain it's current status as a roadless wilderness and federally protected wilderness area. There is precious little undeveloped land left on our earth, and the BWCA looks nearly identical to how it did hundreds of years ago. However, threats to its purity are mounting. I feel a sense of urgency to elevate this issue before time runs out. I feel deeply connected to this place as so many others do; I was lucky enough to spend a week in Ely each summer with my aunt, uncle, and cousins, paddling in for day trips just outside Ely, and just soaking up all the Ely community had to offer. These childhood carefree memories will stick with me forever. When I feel stressed and overwhelmed, I try to remember those strolls down to Miners Lake and Shagwa lake, waiting for my uncle to get off work at Piragis so we could all walk the dogs together and lay in the hammock. I am intricately connected to the strength of these communities and when I am speaking for the Boundary Waters, I also speak for the 17,000 local jobs supported by the tourism and outdoor recreation economy of Ely, Grand Marais, and the surrounding area. I was introduced to the richness of these end-of-the-road communities, and it is clear these communities form around something greater than all of us. It wasn't until high school that I began taking more extensive camping trips into the BWCA, and was able to fully understand the vastness of this place, but my deep love and appreciation for those economies that thrive off the outdoor recreation economy grounds me in my work to, As Edward Abbey once said, "Keep it as it was". You are working to build up a campus organization for the Boundary Waters at DePaul University. Why is it so important to you to get students involved in the Campaign? DePaul is a Vincentian University, modeled after the life and work of Saint Vincent DePaul. His motto, and consequently the University's, was "What Must Be Done". 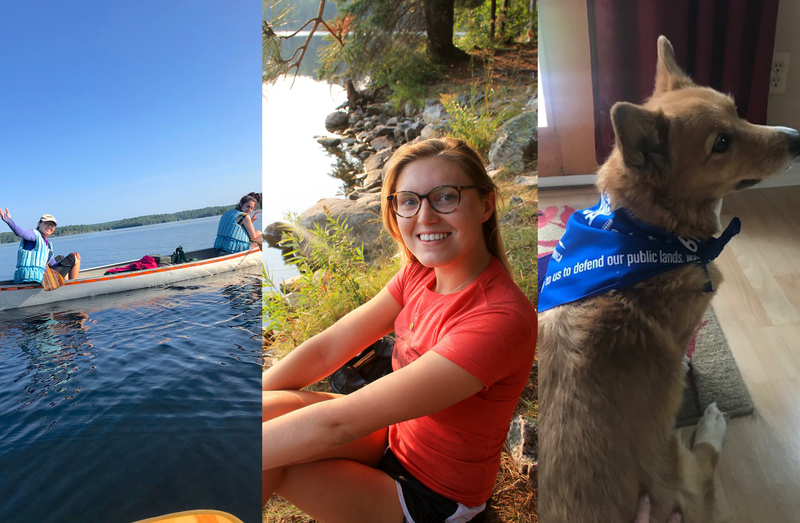 My four years on this campus have taught me how to pursue social justice through action, and leaders of the campaign to Save the BWCA have as well. 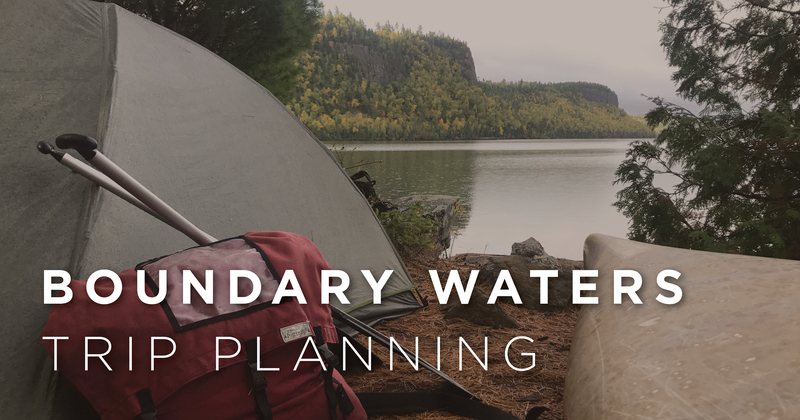 Using the tools I've been given through my coursework and fieldwork experience, I now feel called to share with others what must be done for the Boundary Waters. We cannot afford to risk this indescribable place. I am inspired by the Kids for the Boundary Waters group flying into DC, so I am currently planning agendas for three events on campus this week to support their efforts. This week we'll be signing the petition, writing letters to our elected officials, and forming our next Chicago meet up. Sign up here to be a volunteer! It's Volunteer Appreciation Week and we are highlighting our awesome volunteers! Learn more about Tom Bose. We have so few national treasures left. We have a responsibility to our children and our grandchildren to pass those few to them untarnished. Among the national treasures, the Boundary Waters is the only canoeing wilderness – absolutely unique for us. Would we tear down Independence Hall to build an office complex? Nor should we damage the Boundary Waters for a handful of 30-year jobs. We need to stay true to our responsibility to our children and grandchildren. When did you first volunteer? Cannot remember for sure. Four to five years ago. I remember Becky Rom made a presentation at the Minneapolis Club. As folks were leaving, I asked how I might volunteer. Multiple organizations are working along multiple lines to protect the Boundary Waters. Among those organizations the Campaign is most focused. The Campaign has a clear goal: permanent protection in legislation banning sulfide ore mining in the watershed of the Boundary Waters. The Campaign has a strategy to achieve that goal and is executing on the strategy. The State Fair. You meet folks from all over the state from all sorts of backgrounds. Many leave the booth as supporters. 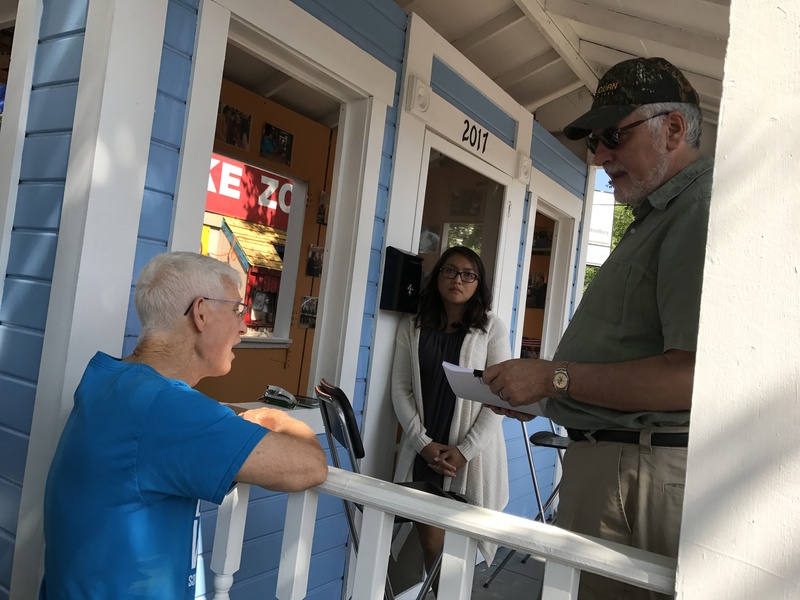 Tom Bose delivering petitions at Minnesota State Fair 2017. Farm Lake. Grew up in Indianapolis. In May, 1952 my Dad came from visiting a neighbor. He said, “I just heard about a boys camp in this fabulous place in Minnesota. I went there in the 1930s with five guys. For two weeks we paddle a route called Hunters Island. You have to go.” In June I boarded a train for Duluth. Arrived at Camp Voyageur on Farm Lake a day later. I was a camper and then a counselor at Camp Voyageur. Made friends there. In the middles 1970s a half dozen of us bought lots along the west shore of Farm Lake. We built cabins together. Our children and now even our grandchildren are learning the experience. We look across Farm Lake to the entrance to the North Kawishiwi, entry point 31 – an entry to a special place. So many special memories from that first campsite on Horse Lake in 1962 to moon light snowshoeing on the North Kawishiwi this past winter. No way to pick one favorite. Friends. The Boundary Waters experience is best shared. Have you seen any interesting wildlife on your BWCA trips? All sorts of birds. The red of the scarlet tanager munching seed pods at our misty July campsite on Gabbro. The pine siskins busy in the Norways at our September campsite on Lac La Croix. The snow geese on the Dahlgren River this past October. The Canadian jays that visited our Little Saganaga campsite for a piece of pancake. The loons calling role around Ima Lake. Chickadees everywhere. “Helinox ground chair! No more logs or rocks to sit on - as the old guys like to say: ‘we don't go to the woods to rough it, we go to smooth it. Things are rough enough in the cities!’"
"Camp shoes. Basic comfort, but it's a great feeling when you stick your sweaty feet in fresh shoes." I have a confession to make: my husband, Dave Freeman, and I do not consider ourselves to be cyclists. Before embarking on a 2,000 mile, two-month journey by bicycle from Ely, MN to Washington, D.C. we had little experience distance touring by bicycle, but we didn’t let that dissuade us from our mission to use this bike tour as a way to raise awareness about the threat of a copper mine being proposed upstream from our nation’s most popular Wilderness Area and Minnesota’s crown jewel— the Boundary Waters Canoe Area Wilderness. We were stoked to learn that Surly wanted to be a part of it by donating two Disc Trucker bikes to the cause. We began pedaling from Ely, Minnesota on April 20, just a few days after one last snowstorm blanketed the northwoods in a foot of snow. Tree branches were still barren and the ice on most of the lakes was several feet thick. An entourage of a dozen people pedaled the first twelve miles with us to the South Kawishiwi River bridge. The South Kawishiwi River is basically ground zero for the proposed Twin Metals copper mine. The water that flows under the bridge makes its way through several lakes and then into the Boundary Waters Canoe Area Wilderness, which means any pollution from the proposed copper mine would flow into the Wilderness Area. Dave and I have engaged in several adventure advocacy projects with the Campaign to Save the Boundary Waters to raise awareness about this threat to our nation’s most popular Wilderness Area. In 2014 we paddled to Washington D.C. in a Wenonah canoe that people signed as a petition to stop the proposed mining. In the fall of 2015 we paddled into the Boundary Waters and remained there for 366 days for this same cause. Spending a whole year in the Wilderness, bearing witness to this 1.1 million acres of lake-studded Laurentian mixed forest, inspired us to write a book. That became a reality one year after we exited the Boundary Waters: A Year in the Wilderness, published by Milkweed Editions. When the book came out we went on a traditional book tour, driving and flying around, living in hotel rooms, living in hotel rooms, eating junk food and getting zero exercise. We thought that there had to better way for us to do this, so we proposed a book tour by bicycle. Dave suggested that if we’re traveling around the country by bicycle, we might as well tow a canoe and gather signatures on it. 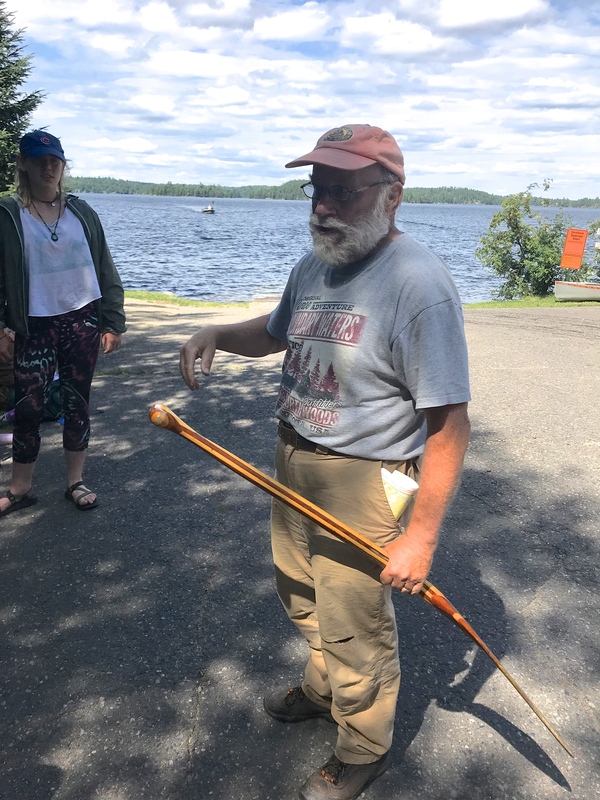 Then, we thought, if we’re towing a petition canoe, we might as well go to Washington D.C. 2018 seemed like the right timing since this year is the 40th anniversary of the passing of the 1978 Boundary Waters Canoe Area Wilderness Act. We were on the road for 60 days and stayed in hotels for 5 nights, camped for 7 nights, and stayed with friends, family, and strangers for the remaining 48. People welcomed us into their homes and often fed us and stuffed our pockets with snacks for the next day. We tried to compensate them for their generosity with a signed copy of our book, if they don’t already have one, and stories from our travels, but I think the real gift we gave each other was just slowing down and being present in people’s lives. Our Disc Truckers saw us through all sorts of challenges along our route. They were always comfortable to ride. We never even got a flat tire. From the hills of Wisconsin’s Driftless Region to the muddy, rutted C&O Canal, and all sorts of trails and roads in between, we didn’t have to give much thought to our bikes because they simply performed exceptionally well in whatever situation we could throw at them. Pedal to DC allowed us to spend time outside being active, observing the natural world, living and traveling simply, while spreading our message about the Boundary Waters. We spent two months feeling the wind, sun, and rain on our bodies. Our muscles were tired at the end of the day, and our minds bright and active from hours of quiet contemplation as we rode. The snowbanks slowly disappeared as we pedaled south. We noticed frogs calling for the first time and watched sandhill cranes migrate overhead. We felt spring gradually turn to summer and as the temperature soared into the 90s, we appreciated resting in the shade of a tree along a country road in a way we never would if we were rushing past in an air-conditioned car. Beyond this, the trip allowed us to engage with people, educating them about the Boundary Waters and encouraging them to take action by signing our canoe—and a petition that we delivered to our elected officials and decision makers when we finally reached D.C. Thank you Surly, for the Disc Truckers and for standing behind a cause you believe in. We’re so glad that you’re playing a role in preserving the Boundary Waters Canoe Area Wilderness. Now, more than ever, it is critical that we let our elected officials know how important our public lands and waters are to us. Please sign the petition at savetheboundarywaters.org. You can find posts from the Pedal to DC and see what we’re up to now on Instagram and Facebook @FreemanExplore. One morning this July, I was fortunate to join hundreds of outdoor enthusiasts at the Conservation Alliance Breakfast in Denver, CO. The Keynote speaker was Mr. Timothy Egan, the inspiring author of one of my favorite books, The Worst Hard Time. He spoke about just one of the many things that has made America great over the last hundred years: Our rich legacy of shared public lands and wilderness. It is a uniquely American concept, and it has a storied history that is both tumultuous and eerily familiar in our current political climate. As Mr. Egan spoke, I began reflecting on my own “conversion” story – that moment in time when wilderness reached into my soul and changed me irreversibly. It isn’t difficult for me to pinpoint – I was six and we paddled into the Boundary Waters Canoe Area (BWCA) for the first time. I spent the next week, shoeless and shirtless, running through the woods, climbing trees, swimming and drinking from the clearest of lake waters, building fires, catching and learning to clean fish and, of course, being utterly transformed as I watched the stars and listened to the stillness of the night. That week remains amongst the most vivid of my life’s memories. That trip instilled a hunger in me for wild places, and soon we were travelling all kinds of wilderness, summers and winters, our trips getting longer and our adventures far reaching – trips across the arctic ice in Svalbard, two weeks living and travelling with Inuit hunters in Western Greenland. But always - no matter where I travelled or how exciting the adventure – every year the BWCA called me home again. All that changed in a blink. In October of 2014, at age 13, my travels came to a screeching halt. Unusual bruising led to a blood draw, which landed me directly in the pediatric ICU with a diagnosis of High Risk Acute Lymphoblastic Leukemia. Just like that, our adventures were on indefinite hold. I was suddenly staring at 3.5 years of daily chemotherapy and wondering, not how I’d survive my cancer, but how I could possibly survive without my wilderness. Inspiration, though, comes from surprising places. The summer before my diagnosis I’d been in Ely, MN, the last town at the end of the road before one heads into the Boundary Waters Wilderness, and I’d learned that a sulfide-ore copper mine had been proposed right on the edge of the Wilderness, within its watershed. This type of mining has never been done without significant environmental damage, anywhere, and has been deemed by the EPA as America’s “most toxic industry.” I’d signed petitions while in Ely and promised I’d do what I could to help the campaign to stop this dangerous and toxic mine. About two weeks after my diagnosis, a representative from the Make A Wish Foundation came to visit me at the hospital. She told me I’d been granted a wish, and talked about the foundation and the work they do on behalf of critically ill children. It was shocking – the idea that my “bad luck” had earned me a wish like that…it set the wheels spinning. Especially as she told me about the wishes they’d granted other children: trips, celebrity visits, shopping excursions, even a swimming pool and pony. For me, choosing my wish was simple: To Save the Boundary Waters. As it turns out, though, wishes take work, even with an organization like Make A Wish in your corner. The political nature of my wish made it impossible for them to help and, ultimately, my wish was “closed” as ungranted. In the meantime, though, I had learned how fight for what matters: my life, (my hair!) and the Boundary Waters. Over the next 3.5 years, whenever my treatment allowed, I travelled to Washington D.C. to meet with lawmakers and leadership to make our case in defense of the BWCA. I wrote blogs, gave speeches, made phone calls, wrote letters and granted interviews – whatever I could do with my time and energy to try and protect this wilderness that myself and so many Americans love so much.. The Boundary Waters are 1.1 million acres of pristine water and unspoiled woods. It has a long history of environmental protections put in place dating back to 1909 when President Theodore Roosevelt established the Superior National Forest. I felt as though I walked in the footsteps of environmental giants with every trip, every meeting, and every small success in the fight. In February of 2018 I took my last dose of 3.5 years of daily chemotherapy. It was remarkably anti-climatic, and as I swallowed the pills and headed up for my homework it occurred to me that as I closed the door on cancer it was time to up my game on behalf of the BWCA. And so on June 19th, in front of the Washington Monument and with a small group of equally committed teenagers by my side, I launched my new initiative: Kids For The Boundary Waters (Kids4BW). The fight for the BWCA is most especially about us KIDS; we will be inheriting whatever mess gets left behind. This is our future, our water, our public lands, our resources, our health, our country at stake. Kids For The Boundary Waters will focus on honing a message of conservation and protection of the BWCA and teaching kids how to advocate - how to write letters, make phone calls, follow up, and how to make personal appeals during DC fly-ins. We all have a huge stake in protecting this wilderness, and beyond that, in learning to effectively and efficiently navigate the political system. Today, we vote with our dollars and our voices, but very soon we will be voting with our ballots. The more engaged we become as teenagers, the more we understand our power and our ability to effect change, the more likely we are to STAY engaged. Though the Kids4BW campaign focuses on preservation and protection of the BWCA, it is my belief that teaching kids about the process of advocacy will undoubtedly spill over into political action in defending - and visiting! - other wild places as well. The BWCA was a “gateway drug” for me, getting me hooked on camping, on backcountry biking, on dogsledding, on backpacking, and on adventuring to remote, wild places around the world. Wilderness adventures instill a hunger for more. And although there are a multitude of reasons why people choose to pick up a paddle – or throw on a pack - and head into the wilderness, one thing is certain: Universally we all come out changed for the better. Since our launch in June, we have been hard at work creating the infrastructure and making the connections necessary to recruit and get our message out. But most importantly, Kids4BW recently activated its network to call and write in opposition to the Nolan-Emmer amendment to the 2019 Interior Appropriations Bill. During floor debate, Rep. Betty McCollum (D-MN) read aloud from 7 handwritten letters she had received from Kids4BW advocates, and at the last minute the amendment was withdrawn when Rep. Emmer realized he did not have enough votes for it to pass. We count this as our first official (shared!) victory on behalf of the Boundary Waters! I know I speak for every member of our Board when I say we take this fight very, very seriously and are committed to doing everything possible to defend the BWCA. Beyond that, we are wholly dedicated to training the next generation of advocates in how to effectively use their voices and their considerable power. I truly believe my generation will become an unstoppable voice for environmental protection, defense of our public lands, and protection of wild places across America. Living with Cancer is no joke – it’s hard in ways that are difficult to articulate, and it takes things you have to fight very, very hard to reclaim. But Cancer is also a surprisingly good teacher. Most importantly, it trains you to fight like hell for the things that matter. Although I’ll still be sorting lessons for years to come, the one thing I have learned for sure is that sometimes life only gives you one chance to get it done. And I think this is it. This is my chance to help save America’s most visited and pristine water Wilderness. I hope you’ll join me in this fight. Meanwhile, paddle on! Joseph Goldstein is a student at Glenwood High School. He lives on a farm in Springfield, Illinois with his parents, three brothers, three dogs, 10 cats, 12 sheep, and a variety of chickens, ducks and other farm critters. He plays the guitar and trombone (marginally) and skis and mountain bikes (awesomely). You can follow the Kids for the Boundary Waters campaign online at their website, Facebook, Twitter, and Instagram. On a sunny afternoon at the end of July, five of my closest friends and I launched from Burntside lake and set out on our two-day camping adventure–destination: Crab lake in the Boundary Waters. I was the only native Minnesotan on the trip, and in fact none of my friends had ever been to Minnesota before! It was a great pleasure to introduce my friends, whom are also students at DePaul University in Chicago, to the wonderful treasures that Minnesota has to offer. Our group had varying levels of camping experience, and we quickly realized that this trip would require a lot of learning on the fly. The majority of the ladies learned to paddle moments before setting out onto Burntside, and all of them were taught how to portage earlier that day at my uncle’s home. Despite having little to no experience each member of the trip proved how resilient and innovative they could be in an unfamiliar environment. 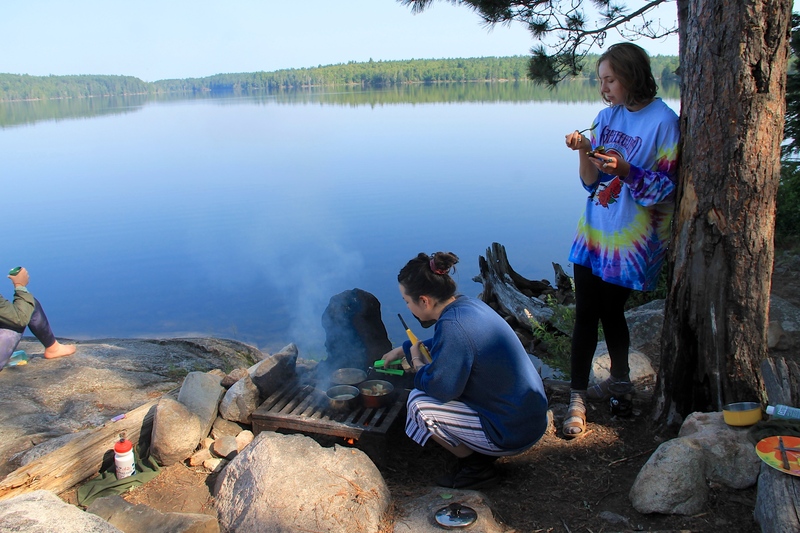 The girls have told me they now feel mobilized to protect this wilderness after basking in the Boundary Waters’ expansive beauty; they have all formed deep personal connections and memories with this place. They all remarked at how powerful a feeling it is to put yourself into a situation that is new and challenging. 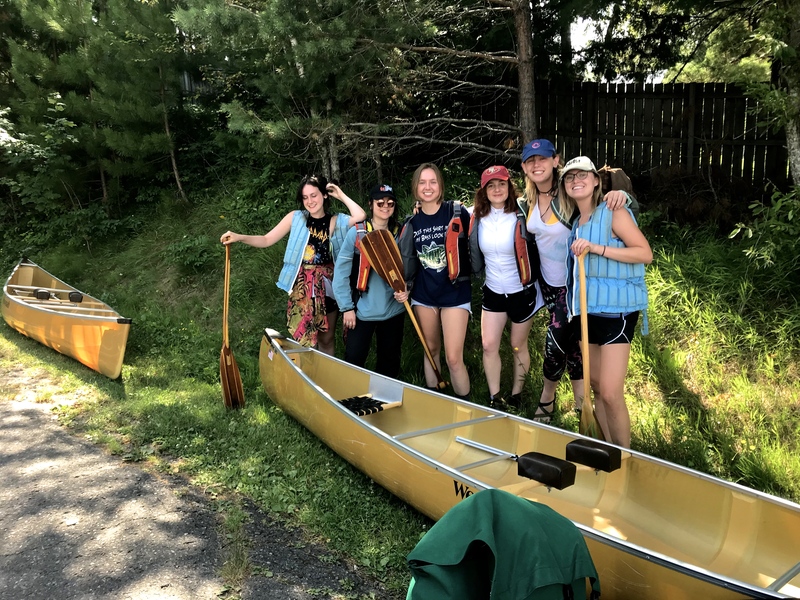 Each of these women learned just how far they could be pushed in the expansive wilderness that makes up the Boundary Waters. We were all extremely grateful for the experience to get to know each other better and bond in a setting as awe-inspiring as the Boundary Waters. Plans are already underway to make this an annual trip, and the humbling influence of the Boundary Waters’ beauty will be extended to my friends’ friends, mobilizing to protect this special place. These testimonials speak volumes to the power a place can have on a person, even after just one visit. The whole group before we paddled out from the public landing on Burntside Lake, just 15 minutes away from Ely. The girls and I would soon go on to problem solve as a team to so we could find the portage entry behind many, many, islands. This trip report must kick-off, of course, with my uncle, Steve (and also, not pictured, my Aunt Annie) for providing most of our gear and for effectively and efficiently explaining everything we would need to know about our trip. We are so thankful and grateful to Steve for his expertise and support for our adventure! The instant wave of relief that washed over everyone was evident as we arrived at our campsite, two hours before this photo was taken, leaving us plenty of time to set up and go for a quick dip in the lake before dark. The propane camp stove that uncle Steve had so graciously supplied to us was not working in our favor on the first night, so we gladly opted for PB&Js. Here is Lorissa thoroughly enthused about her camp dinner. 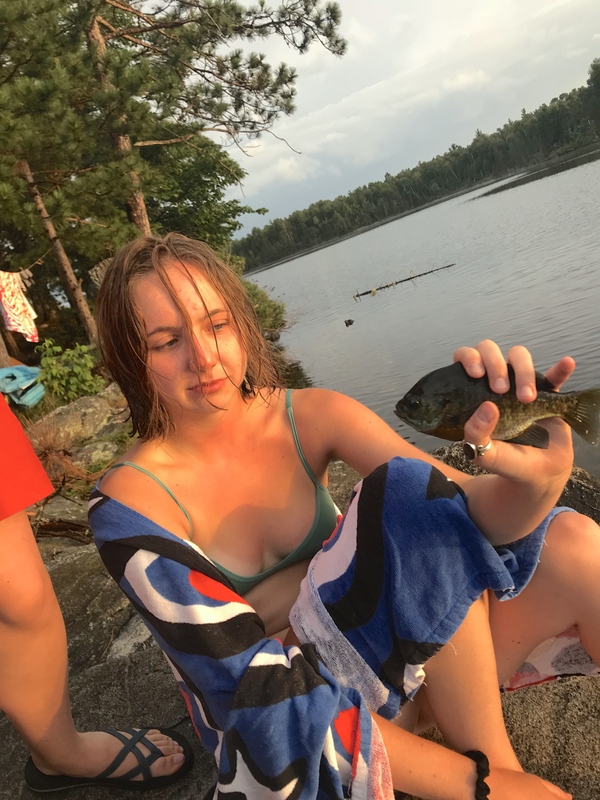 There is really an interesting story behind this photo…but in short, Megan crafted a fishing pole and hook from the bare elements and managed to catch this fish against all odds. Thanks Lori for being brave enough to hold this lil’ guy for the photo! Mattox asserted herself beautifully in many aspects of the trip, but took extra special care and direction when the coffee making was at hand. As you can see, our camp kitchen was really top notch, as was the view from the dinner table. One of our tents with the two Wenonahs. Not pictured – the aluminum canoe that I got the privilege of portaging on the 420-rod path from Burntside Lake to Crab. That being said, every person had an intensely difficult task on the portage, and we conquered the second longest portage in the BWCA with 5 first time visitors to the Boundary Waters. Luna enjoying her breakfast potatoes. Lorissa coming up from a casual swim to a nearby island. The best kind of BWCA camping trips focus on relaxation in my opinion, so this was one of our most challenging activities of the day. Mattox climbing up our lovely landing rock after a long soak in the lake. Crab lake was wonderfully warm. Some BWCA camping essentials. 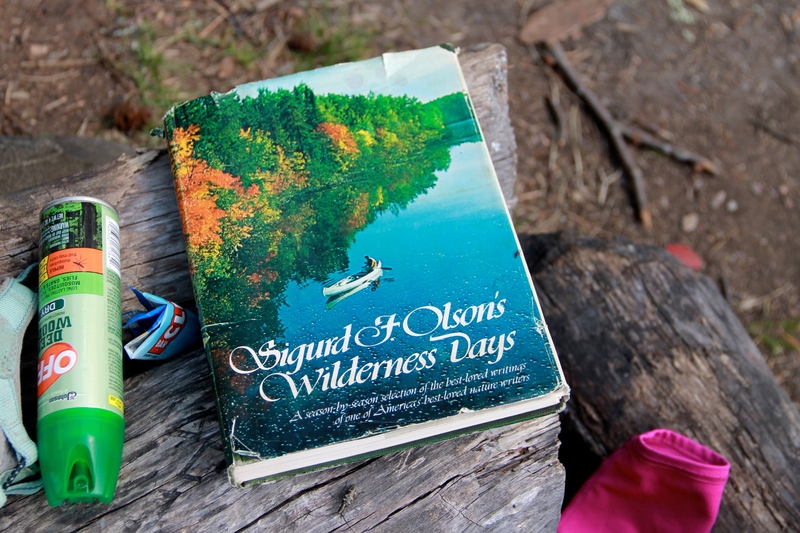 We had an exciting thunderstorm and rainstorm on Saturday night, but luckily we had snacks and some legendary camping stories from Sigurd Olson to get us through it. 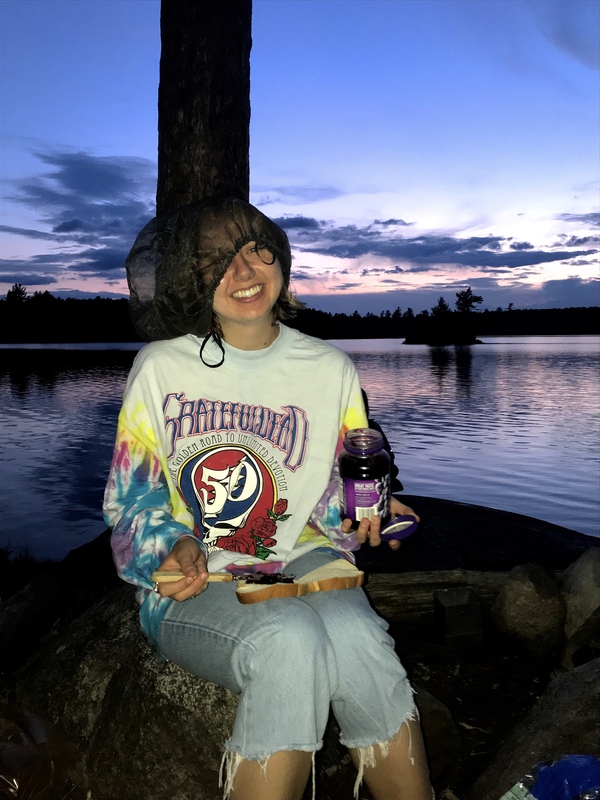 Audrey grew up in the Twin Cities, and is now a development intern at the Save the Boundary Waters Campaign in the Minneapolis office. 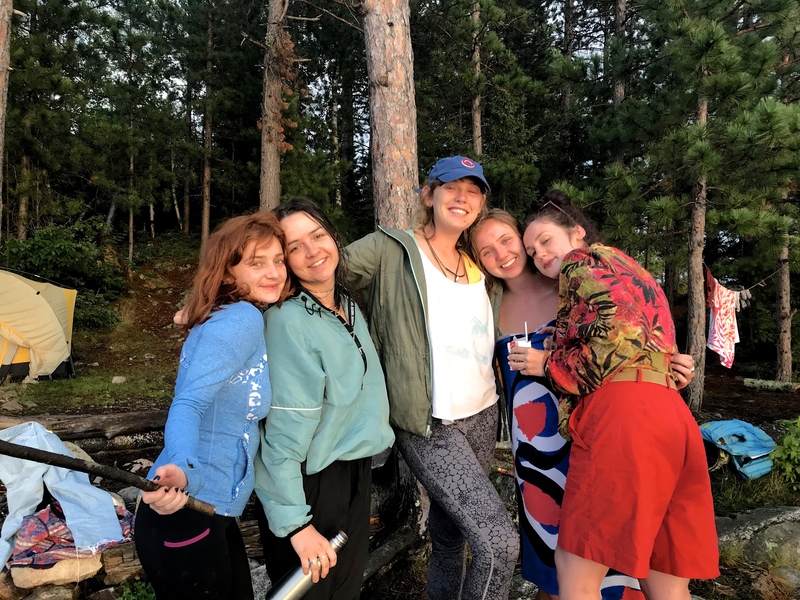 She has always enjoyed summer trips up to Ely to visit her aunt and uncle and explore the surrounding area, so she jumped on the opportunity to share these experiences with her out-of-state friends. Looking to swap stories? 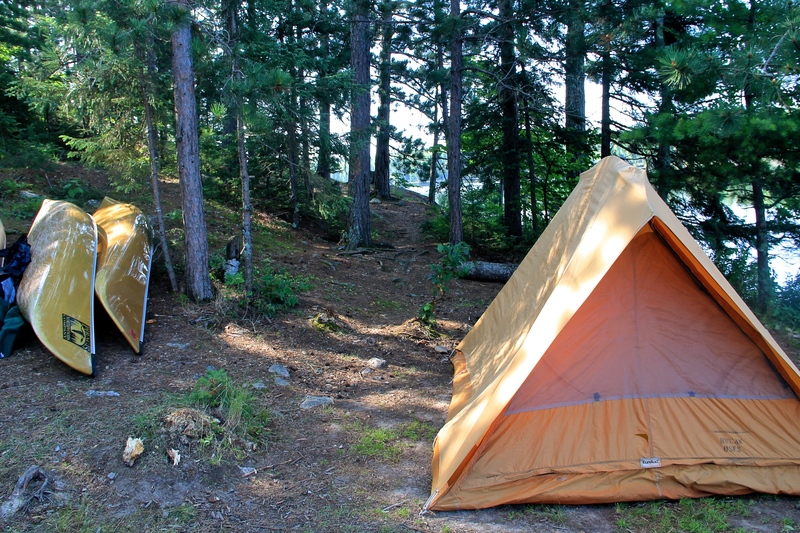 Do you have some sweet photos to share from a recent Boundary Waters trip? Send your stories our way and we might just feature them on the blog! For all those backcountry-cooking enthusiasts out there who haven’t tried this yet, or anyone wondering why they wouldn’t just stick to freeze-dried and dehydrated food while on a Boundary Waters trip, I’m going to do my best to convince you to try, just once, to make bread from scratch on your next trip. It doesn’t have to be crazy fancy, but it sure could be. The first time I made bread in the backcountry was on a National Outdoor Leadership School (NOLS) trip during my sophomore year of college. 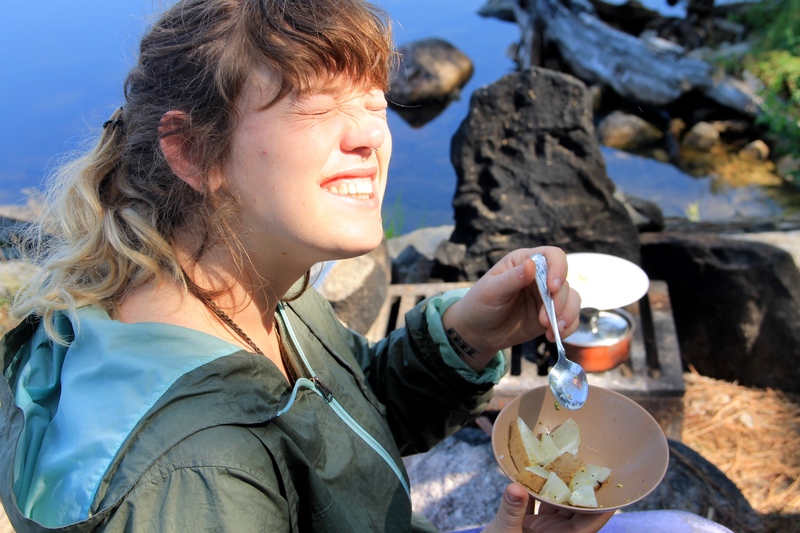 I took part in the Patagonia Semester course, and in our food rations we had all the standard stuff we’d need to cook simple meals like pasta, cheesy lentils, cinnamon and apple oatmeal, and fry pretty much anything. We also had white and wheat flour, delicious Chilean spices, and the means to make cinnamon rolls, lasagna, pies, quiche, birthday cakes (yes, with candles and sprinkles), and even a fruit cobbler. Cooking became the focal point of each day, the one time when everyone could just sit and focus on one thing instead of all the chaotic factors that sea-kayaking and mountaineering in Patagonia brought with them. It was our decompression and community-building time, and we all developed a really thoughtful relationship with the food we were eating. It was my first experience cooking in the backcountry that I truly cherished. Now, picture this: you’re at camp, the sun is setting, and there’s nobody else but you and your group on the lake. It’s a huge lake, probably Saganaga, maybe Knife. You wonder, “hmm, strange there’s no one here, but I’m not complaining”. As the sun descends from its golden height into a dampened silvery-purple, you reach into the smoldering fire and pull out a freshly-baked, steaming, golden loaf of bread. 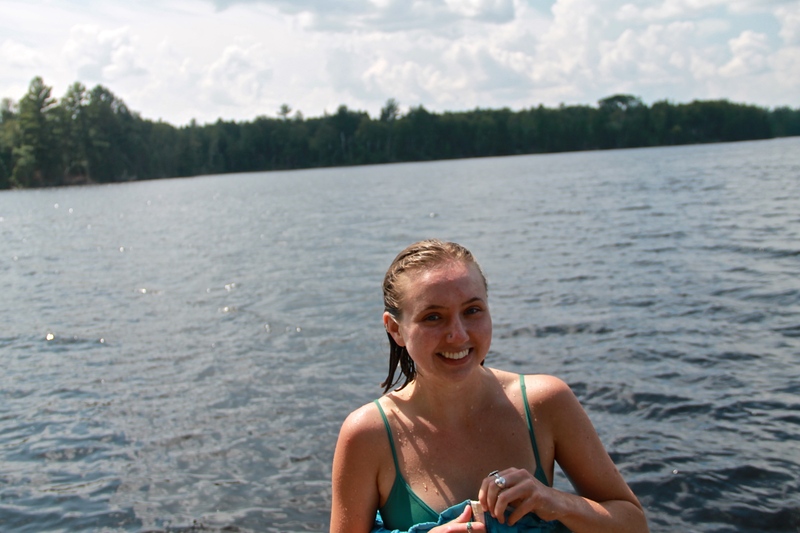 In a single loon call, the entirety of the Boundary Waters cheers at your accomplishment. Your group basks in the heat of the dying fire and the warmth in their tummies, and then you have the best night's sleep of your life. The next day you paddle like you’ve never paddled before, the water practically parting before you at the bow of your canoe. Dissolve yeast in lukewarm water with sugar, and salt. Cover and let sit for 5 miuntes in warm spot until it froths. (Try putting it in an insulated mug and capping it. when frothed, it bubbles through the hole a little.) Add half the flour and beat vigourously 2 to 3 minutes to develop the gluten; the wet batter will smooth out and start to get a little stringy. Add margarine and remaining dough to get a thick dough. Flour your hands and knead the bread on a floured pan. Knead with the heels of your clean hands for about 8 minutes, folidng when dough becomes too sticky to handle. The dough will be silky and springy when done. Shape into a loaf and place in a well-oiled pot or fry pan. Press dough out to touch the edges, and grease the top of the loaf with oil or margarine. Cover and set in a warm place to rise for about 1 hour, or until doubled doubled in size. If it's a very cold day, let the dough rise by placing on top of a pan of boiling water with a cover over it. Once risen, bake the bread 30 to 50 minutes in a low fire with coals or on top of a stove. Use a twiggy fire on top of the cover or flip it to bake the top. When done, the bread will be a golden brown and will have a hollow sound when thumped. Take it out of the pot/ pan and cool it in a spot with good air circulation 5 to 10 minutes before cutting. This is one of many ways to enhance any backcountry cooking experience, but don’t fret if it goes wrong the first time! I’ve burnt more bread than the average college-student with a toaster. And just to be clear, I had freeze dried meals on my last Boundary Waters trip and loved them. They’re actually very yummy and certainly more lightweight than packing in a bunch of flour, but that’s besides the point. Have you tried making backcountry bread? Tell us about your favorite backcountry recipe, or your favorite experience cooking in the backcountry. We know there’s probably some pretty creative ways to do Boundary Waters fish out there. This post has been summarized from a longer piece that our board member Ellen Hawkins recently sent our way. You can read her piece at this link, which we highly encourage you to do! Many thanks to Ellen for sharing this with us and offering a glimpse into the world of our Wilderness, winged friends. The Superior National Forest, an important Birding Area with the Boundary Waters at its core, is recognized as having global significance in the world of avian conservation. It’s home to 225 species for at least part of each year, with 45 more species spotted occasionally. As many as 165 species nest here. It supports the highest diversity of breeding Wood Warbler species (24) anywhere in the world. The numbers of individual birds is also impressive, and those population density numbers indicate what top quality habitat this is for many species. It’s clear that maintaining the pristine condition of the Boundary Waters is absolutely critical to their long term survival. Laura Erickson has been speaking for the birds on a nationally broadcast public radio show for 32 years. 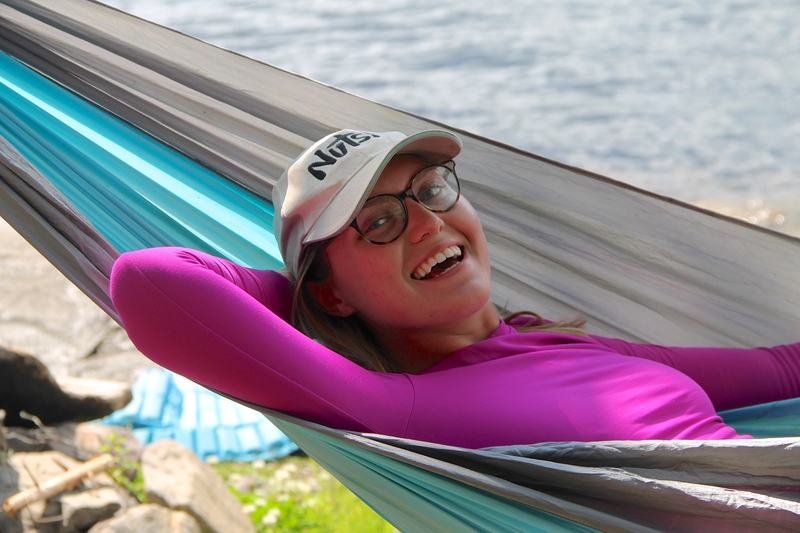 Maybe you can hear her familiar voice in your mind’s ear, saying, “This is Laura Erickson, Speaking For the Birds.” On June 23 she came to Cook County to speak for the birds of the Boundary Waters. Laura is the 2014 recipient of the American Birding Association’s prestigious Roger Tory Peterson Award for her lifetime’s work as a teacher, author, and science editor at the Cornell Lab of Ornithology. She spoke of the astonishing diversity of birds that finds an essential sanctuary in the Boundary Waters Wilderness, but the venue was a segment of the Superior Hiking Trail several miles from the Wilderness boundary. The logistics of doing it in the Wilderness was just too daunting, but as Laura pointed out, every bird we saw or heard can also be found within the Boundary Waters during breeding season. Waiting at the trailhead for the early event of the day, a bird walk, we watched a Cedar Waxwing on a nest and heard a Tennessee Warbler. They are one of the three spruce-budworm specialists (along with the Cape May and Bay-breasted) among the 24 warbler species that nest here, and they’re a great example of how essential insectivorous birds are for healthy forests. For example, a Tennessee warbler can consume 65 to 100 caterpillars, roughly half its weight, every day. These insectivores have the power to regulate outbreaks of forest pests in ways we’re just catching on to. And speaking of birds being useful: they spread seeds, cycle nutrients, pollinate plants, prune prey populations, clean up carrion, and sometimes, to our delight, put their gorgeous and fascinating selves out where we can admire them. Laura’s presence at the event also demonstrated some other ways birds are important to people: they can be a huge inspiration for a life’s work of spiritual or artistic endeavors, and the best entertainment ever. More prosaically, the Fish and Wildlife Service found that bird watchers spend nearly $41 billion annually on trips and equipment. Local community economies benefit from the $14.9 billion that bird watchers spend on food, lodging and transportation. In 2011, 666,000 jobs were created as a result of bird watching expenditures. I don’t know what piece of that pie belongs to northeast Minnesota, but with Boundary Waters and surrounding Superior National Forest an international mecca for birders, it’s bound to be significant. All this isn’t meant to contradict the incontrovertible: these birds of course have to the right and reason to exist aside from however we might benefit from them. Most species on our walk had to be identified by song on this beautiful summer morning: it’s a huge challenge to spot a singing bird once the leaves are out. Luckily there were some excellent local birders along, plus Laura, who made that work. Our group counted 31 species and 80 individual birds on that pleasant two and a half hour walk. The wild call of a loon was a good possibility for our bird walk, but by chance none flew over–or if one did it was quiet–but they are a bird that belongs in this piece because loons are key players in the wilderness ecosystem and in the mining issue. Mining would add a new source of methylmercury pollution to the many deadly dangers loons face. Loons can live a long time. We see individuals coming back to the same lake, or the same bay of a big lake, year after year, sometimes for decades, to nest at their favorite bit of shoreline. If mercury is present in a water body, it becomes distributed through all levels of aquatic food chains by means of bioaccumulation. Plants and small organisms like plankton take up mercury and then are consumed by bigger organisms and so on, all the way up to loons (and eagles, otters, and people). If a loon’s lake is contaminated with mercury, over time, the toxin will accumulate in the loon’s body. Mercury poisoning changes behavior, resulting in diminished reproductive success, and it kills loons. Mercury can be a component of air pollution that falls out across lakes and streams, and it can also enter water directly from active and retired mining operations. Acid mine drainage, a byproduct of mining in sulfide-rich ores, leaches heavy metals like lead and mercury into surface or subsurface waters. These acidic and toxic waters flow from mine sites through the environment (in ways that humans often can’t foresee), causing loss of aquatic life and leading to catastrophic changes in that ecosystem and to human recreational and economic endeavors that depend on it. This is the inevitable end result, based on the evidence presented by science, the history of this kind of mining, the sad testimony of sickened and dead wildlife, thousands of miles of ruined streams and many lakes, and contaminated groundwater drinking supplies. Birds need clean water, shelter, good food and an opportunity to reproduce. They find that when they make it to the Boundary Waters. The Boundary Waters and surrounding wildlands are the critical nesting habitat of many neotropical bird species, ranging from vireos and warblers to flycatchers and thrushes. For them, an ample food supply exactly when they need it is reason enough to run the gauntlet. For the permanent residents this place provides a home with everything they need in all seasons. Jay Gustafson, known as Waterway Jay, is spearheading a project called Paddle for Progress, which is galvanizing Minnesotans to take pride and ownership of the freshwater ecosystems that make our state unique. In partnership with local nonprofit and state agencies that are committed to water quality issues, together we can find the solutions needed to protect and preserve our waterways. Jay’s vision and ours fall right in line with each other, and we’re proud to have his voice here on our blog. Give this a read and stay up to date on Jay’s progress! The mission of Paddle for Progress is to galvanize Minnesotans to take pride and ownership of the freshwater ecosystems that make our state unique. In partnership with local nonprofit and state agencies that are committed to water quality issues, together we can find the solutions needed to protect and preserve our waterways. Although I was born and raised in South Dakota, I’ve felt a connection to Minnesota since my childhood. I fell in love with paddling on a father/son trip to the Boundary Waters at age 12. I could have never guessed that 20 years later, I would find myself feeling called to make my life’s work protecting the waters that I first discovered at such an early age. I moved to Minnesota in 2006 upon graduating from the University of South Dakota. Soon after, I learned that in addition to endless paddling opportunities in the BWCAW, Minnesota offered a tremendous resource on it’s 34 mapped river water trails. After spending nearly every summer adventuring out of Ely, over time, I was spending more and more time adventuring on rivers such as the Rum, Snake, and St. Croix. In 2016, my cousin Jeremy and I decided that we would pursue our long-held dream of paddling the Mississippi River from source to sea. On June 1st of that year, we began what would be an odyssey not soon to be forgotten. Traveling through 10 states and paddling over 2361 miles, we were amazed by the kindness and generosity of others from northern Minnesota down to the southern reaches of Louisiana. Waking up each morning to enjoy creation helps you realize that there is nothing greater than setting forth each day with a purpose and a passion. Upon my return to reality in September, I found myself becoming increasingly restless at my job of nearly 10 years. As I began exploring next steps, Governor Dayton’s call for a Year of Water Action caught my interest. I was deeply troubled when I learned that 40% of our states water was considered impaired. How I wondered, could a state that is known for clean water, environmentalism, and civic engagement have nearly half of it’s water contaminated and unsuitable for aquatic life and recreation? The more I read about the state of Minnesota’s water, the more concerned I became. Having had the space and time on the Mississippi River to understand what the pursuit of a passion felt like, I decided I could no longer stay on the sidelines. I decided I needed to do something. I started, Paddle for Progress. In July 2017, I resigned from my job of 10 years and began paddling in their entirety the 34 rivers mapped by the DNR in order to raise awareness across the state about our water quality crisis. I believe it is imperative that the people of Minnesota understand the threats facing our water, and the steps needed to reverse course. My goal in paddling these rivers goes beyond raising the alarm about the need for further action however. I am also making maintenance recommendations to the DNR for campsites, landings, and channel conditions. Additionally, I volunteer with the Pollution Control Agency through their Citizen Stream Monitoring Program. I am wholly committed to protecting and preserving the water we have in Minnesota as I believe it is our states greatest asset. Whether it is the Boundary Waters or the lakes and rivers across the Minnesota landscape, we all have a role to play. The connectedness of water and our connection to it can be mistaken as an outdoor recreation or sportsman only issue. It would be shortsighted to think of water in these limited terms however. We base our economy through tourism and agriculture on water. We have a thriving craft beer and food truck industry that is not possible without water. We go up north, relax, and vacation around water. Most importantly, every day we turn on the tap to eat, drink, and bathe because of access to clean and reliable sources of water. Please join me in becoming part of the solutions to sustain and improve our water across Minnesota. Let us all work together to stop the degradation of this precious resource and let us together fight back against interests that threaten our beloved Boundary Waters and watershed’s across the state. You can follow Gustafson’s progress on his website: https://www.waterwayjay.com. He can also be found on Facebook, Instagram and Twitter searching: @waterwayjay. Updates on rivers, events, photos, and progress will be available throughout his journey. Gustafson is actively seeking support through funding and logistics to continue his work on, Paddle for Progress. A list of remaining rivers and tentative dates is below if you can assist with transport. Waterway Jay also has an active GoFundMe campaign set up that can be accessed at the following address: https://www.gofundme.com/paddle-for-progress. If you or an organization you are involved in would like to find ways to partner with Waterway Jay, please contact him directly at: waterwayjay@gmail.com.